This past Tuesday marked the first day of Spring! Spring, for me, has always meant iced coffee. Always. I wrote a post several years ago with my homemade iced coffee recipe. You all were as obsessed as I was! You also asked some great questions and I figured it was time for an update! So this is your literal, one-stop-guide for all things homemade iced coffee. But first, I am so excited to share with you a course I am going to go through that is also for Spring! The Cozy Minimalist Celebrates Spring! Everybody, everybody, I still have greenery from Christmas on my dining room table. I need a refresh. This is right up our alley. We are committed to bringing people into our homes and our tables in all seasons of our life. Also, her course includes how to set-up a fun iced coffee bar and we love our iced coffee! Learn more here and let’s do this together! Whenever I serve someone iced coffee I always get asked what I use to make my iced coffee. I use the Bodum Cold Brew French Press. I have had this for nearly 7 years and it is still going strong. I use it every week from Spring-Fall. Why a cold brew press? Cold brewing is 70% less acidic than hot brewing (i.e. pouring hot coffee over ice). When you allow your coffee to cold brew for up to 12 hours you get a rich, smooth iced coffee that is perfect every single time! This cold brew press makes 51 ounces of iced coffee which lasts Jeremy and me for the whole week. First, buy your favorite kind of coffee beans. For iced coffee, dark roast or even espresso beans are the way to go. This is what every barista I have ever asked tells me. And I have asked a lot of baristas at my favorite coffee shops because I wanted to make the most amazing iced coffee at home. It’s because cold brew is a less acidic process that it can stand up to a darker roast. These are my favorite beans for iced coffee! I get them at my local whole foods or you can also get them from Amazon! 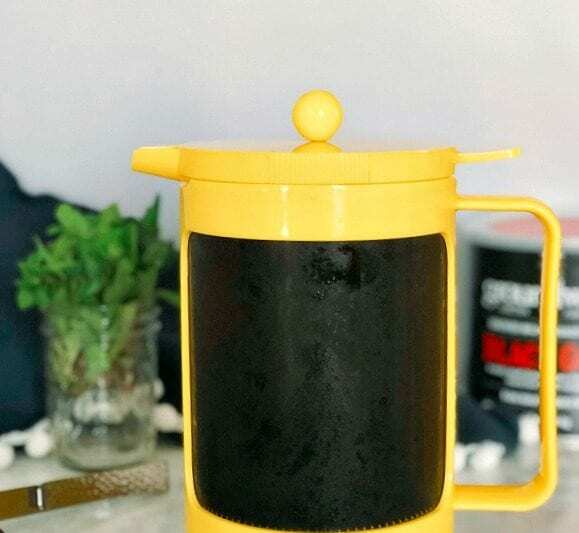 As for the measurements, if you get the Bodum Cold Brew Press, it comes with a scoop that measures about 1 ½ tablespoons of course ground coffee. Because the flavor is not being extracted by hot water, you want to make sure you have a good amount of beans to steep in the water to get that rich flavor. This turns out to 15 tablespoons of coarse, ground coffee beans and 5 cups filtered water. The beans also need to be ground coarsely, or if you are asking your barista to grind a bag of beans, ask them to grind them for a French press. Add the beans and water to the French press. Give it a stir and then put on the airtight lid (my cold brew press comes with the pour/press lid and also an airtight lid for brewing). I like to let it steep overnight. In the morning use the press/pour lid to press the coffee. Lots of you asked me the exact ratio I use for my iced coffee when it comes to beans and cream. I’m here for that! I like to fill my glass up with ice. In fact when I buy iced coffee, I ask for extra ice! I love very cold iced coffee! As for the cream, I only use heavy whipping cream. Oh my goodness, that stuff is like drinking a milkshake, but there is no sugar! Depending on where you fall on the paleo spectrum, some people say full fat heavy cream is paleo and some say it is not. I SAY IT IS! I like about two tablespoons. That’s it! I do not like sugar or sweetener in my coffee. Give me all the dark, deep flavors of the coffee bean with that velvety, smooth heavy cream! If you do like to sweeten your coffee, I make a mint simple syrup (no white sugar!) that has converted me! Mint iced coffee is my summertime pick me up. Proud about it! You need to try this at least once in your life. Let me know if you are a believer! This is everything you need, friends! This method is full-proof. You will always have a perfect batch of iced coffee. Also? This coffee is perfect to put in mason jars and take to friends and neighbors! Ok, let’s go make all the iced coffee and go through the Cozy Minimalist Spring course together! We are doing Spring right! Add ground coffee to cold brew French press. Pour in water and stir to combine. In the morning press the coffee. To serve, fill a cup with ice. Add 1-2 tablespoons heavy whipping cream. Be sure to try mint simple syrup! Will last in the refrigerator with the airtight lid for up to two weeks. Do you take your own pictures or do you have a photographer friend? I LOVE looking at the pictures :D they make my heart happy! I take all my food photos! I am so grateful you enjoy them! What joy! !